There is 1 reply in this Thread. The last Post ( Sep 30th 2014 ) by Dji1977. 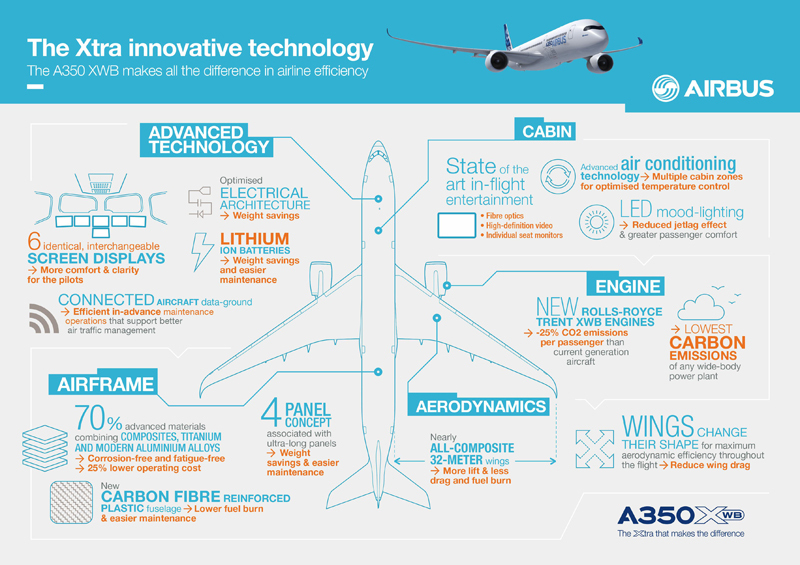 The world’s latest generation commercial airliner, the A350-900, has received Type Certification from the European Aviation Safety Agency (EASA) on 30th September 2014. The certified aircraft is powered by Rolls-Royce Trent XWB engines. Federal Aviation Administration (FAA) certification will follow shortly. “The A350 XWB manufacturing programme has also been innovative and ambitious, aiming for a fully mature aircraft at entry into service and this is what we are proud to be delivering to our first A350 XWB customer, Qatar Airways, before the end of the year. Our fleet of five test aircraft completed the certification campaign, on time, cost and quality. Accumulating more than 2,600 flight test hours, we created and successfully achieved one of the industry’s most thorough and efficient test programmes ever developed for a jetliner,” said Fabrice Brégier, Airbus President and CEO. The A350-900 Type Certification comes after successfully finishing a stringent programme of certification trials which has taken its airframe and systems well beyond their design limits to ensure all airworthiness criteria are fully met. The A350 XWB is Airbus’ all-new mid-size long range product line and the newest member of Airbus' leading widebody family. 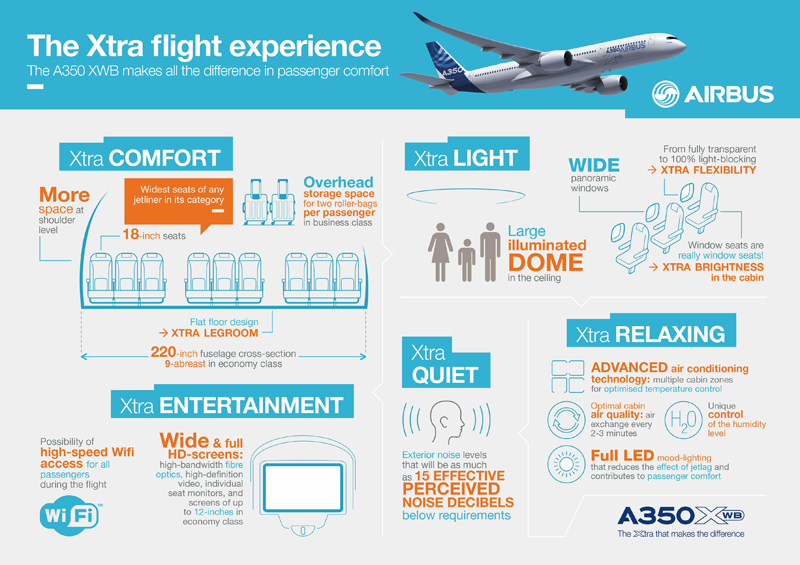 The A350 XWB stands out in its class thanks to its combination of passenger comfort, technological innovation and its unique industrial process. Built hand-in-hand with our customers, the A350 XWB sets new standards in terms of passenger experience, operational efficiency and cost-effectiveness. 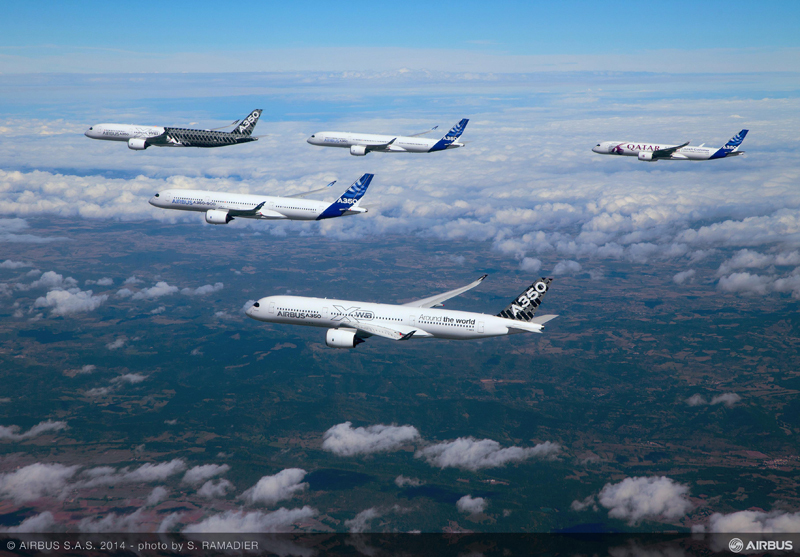 At the end of May 2014, the A350 XWB had won 750 orders from 39 customers worldwide.